The Midland ER102 radio is a handy multipurpose device which provides you with tools useful for both everyday use and for emergencies. The radio is powered through a wind up/crank handle, allowing you to provide the power whenever it is required ensuring that it is always ready for action. 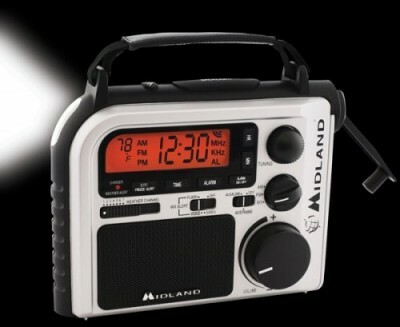 This Emergency AM/FM Weather Crank Radio by Midland is able to provide you with a AM/FM radio, LED flashlight, thermometer and All Hazards Weather Alert radio, and a traditional sound alarm system alongside a visual alert for the hearing impaired. The dynamo powered device uses the wind up/crank handle to provide the energy that is converted to electricity. This allows you to be able to power the device no matter where you are, perfect for outdoor usage while camping or for indoors during a power cut. By turning the handle you supply the energy to charge the internal rechargeable NiMH battery pack, the device though can also be powered through 3 AA batteries (preferably rechargeable ones!) or through an AC adapter (included). The Emergency AM/FM Weather Crank Radio features a water resistant design, allowing it to function even out in stormy weather. The device can provide you with light through its LED torch perfect for illuminating you way in the dark or in emergency situations without any worry over running out of power. The LCD screen of the radio is large, clear and can be back-lit for use in dark conditions, and has a clock and an alarm feature. Through the USB connector you can charge any of your portable electronic devices that have a USB charging point, allowing you to keep your phone charged while away from mains electricity, or during an emergency. This rugged radio is a great device for those who enjoy outdoor activities and for those who simply want a great functioning tool in case of emergencies. Due to its eco-friendly power source, the device can be easily charged by you whenever it is required, avoiding any search for charged batteries. The radio has many features that allow it to be valuable in emergency situations and yet useful for day to day use, all in all it is a handy device to have around. 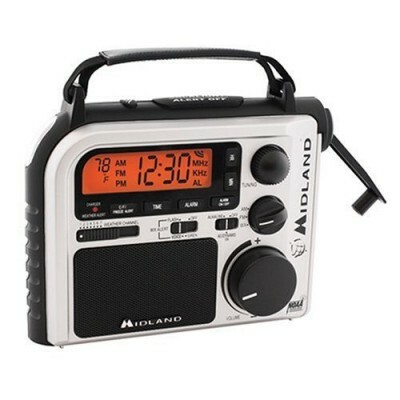 The Midland ER102 radio is yours for just $36.19 and comes with free shipping.